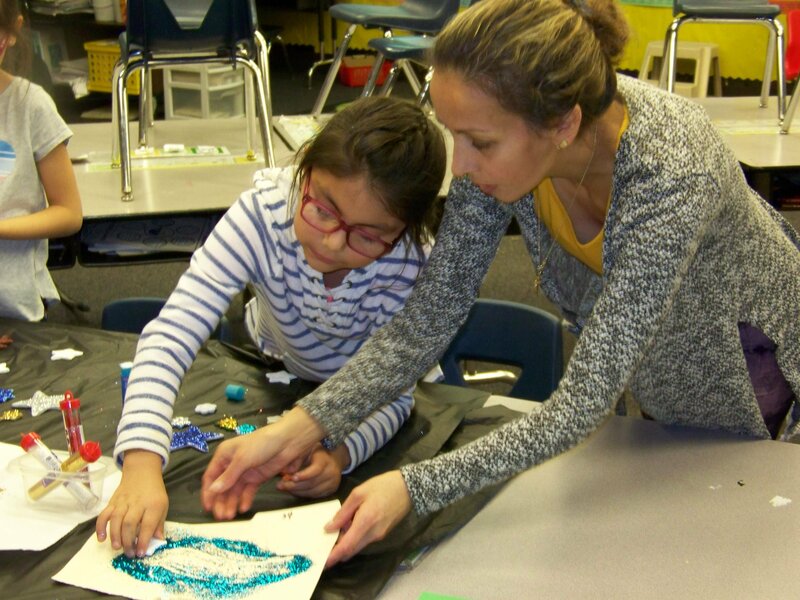 Every Thursday, three Spanish-speaking mothers at Jewell Elementary School in Bend take on the role of teachers. 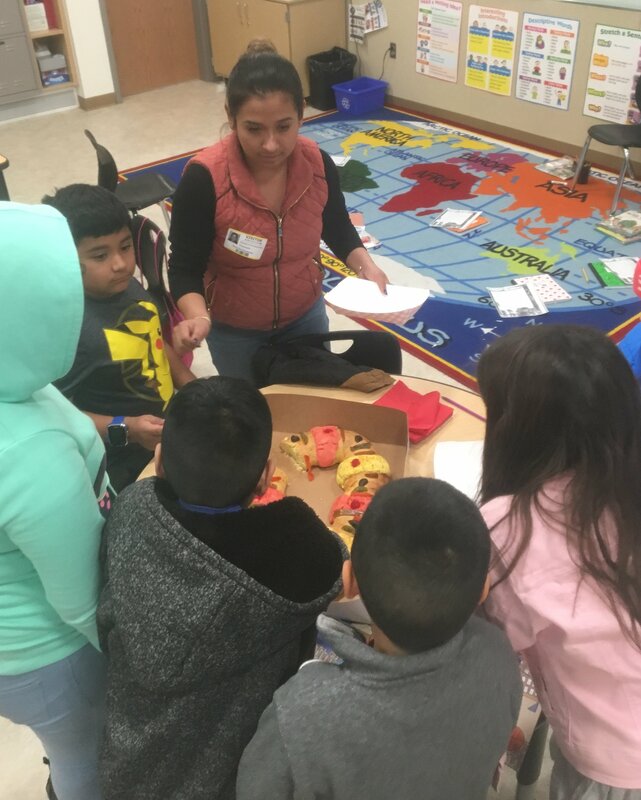 They volunteer after school to teach 21 Latino students to read and write in Spanish, learn traditional Mexican songs, and feel good about their culture and themselves. These moms form the backbone of the RAICES Spanish Literacy & Youth Empowerment Program of the Latino Community Association at Jewell. LCA also runs RAICES at Silver Rail Elementary in Bend. “We want the students to come to terms with who they are culturally,” said LCA Program Manager Oscar González. 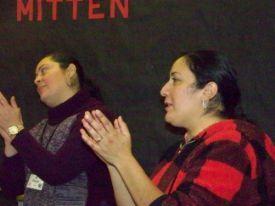 PHOTOS: Above: Margarita Garcia (left) and Pilar Cruz teach Mexican songs to their students. Left: Griselda Franco and her students sample Rosca dd Reyes (cake of kings) to celebrate the arrival of the Magi on Jan. 6. Below: Maria Rita Rubalcava helps a student create a Christmas card. Photos by Denise Holley and Renee Sanchez. Margarita and her friends Maria Rita Ruvalcaba and Pilar Cruz helped start the RAICES program at Jewell in May 2016. “For me, it’s very important for the kids to continue with their first language,” Maria said. Once the kids begin learning English, they may hesitate to speak in Spanish. Margarita noted that some of the kids don’t know where their parents came from and “the efforts they made to be where they are now. We are role models for our children,” she said. She began teaching RAICES in September and can hear an improvement in the students’ spoken Spanish, she said. During the holiday season, the class learned why the U.S. celebrates Thanksgiving and how Mexico and El Salvador celebrate Christmas. This semester, Franco will teach the class pronunciation and “how to put sentences together in Spanish,” she said. She believes the students speak Spanglish at home and need to communicate better with their parents. “When they’re little, they have the capacity to learn more than two languages,” Franco said. She is majoring in early childhood education at Central Oregon Community College and provides child care for parents attending LCA English classes in Bend, she said. She also works part-time in the housing department at NeighborImpact. These volunteer moms make RAICES happen and LCA is grateful for their work and dedication.